1729. 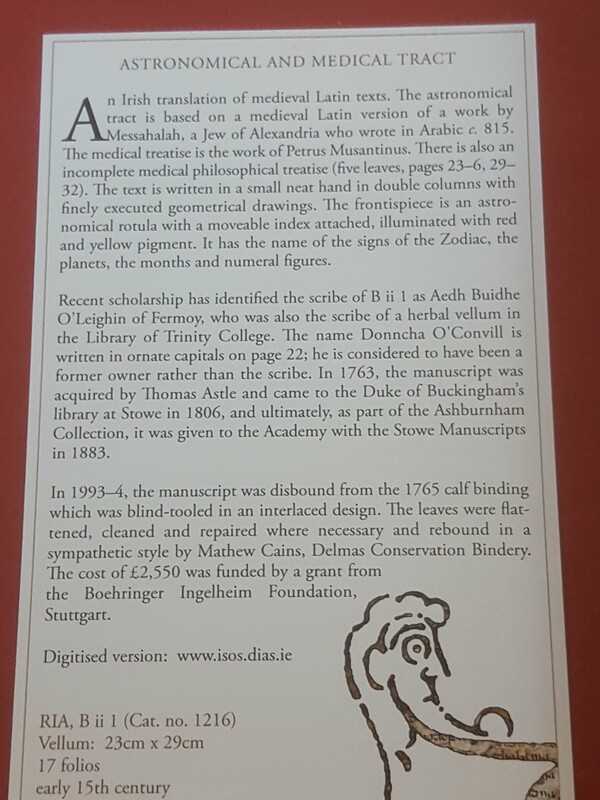 Daniel O’Donovan, (The O’Donovan) Bawnlahan, Leap, Skibbereen, Renounced Popery. Late 1844 Sir Richard de Burgo. Recanted at Castletownroche probably in connection with marriage. From 1590 West Cork experienced very substantial inward migration marking it out as different then most parts of Ireland excepting Dublin, Cork and some of the Northern Counties. Allied to that at 1840 it had one of the world’s largest rural population density. Massive emigration from the 1810 means that many worldwide have connections. DNA testing is now showing that a person’s religion or surname only partly explains their complex genetic inheritance. Castletownroche records transcribed 1909 by Colonel Grove White. Note by Paddy O’Keeffe, Bantry Historian. Son of Richard and daughter of the Knight of Kerry. ‘The O’Donovan’ the head of the Clan who in his 60s married firstly Miss Anne Kearney, Garretstown, for the second time Jane Beecher aged 15/16 and had a second large family. He renamed the Bawnlahan Estate Castle Jane. Renunciation after first marriage and The Kearneys of Garretstown House also renounced relations the Franks, Rochfords. 49 years before his death. His grandson Lieutenant General Richard O’Donovan, married Miss Powell from Wales, they had no children the estate passed to her nephew. The title of Chieftain ‘The O’Donovan’ passed to the Montpelier (Douglas) Cork branch. Father or grandfather of Lieutenant general Richard O’Donovan, on his death line passed to Rev. Morgan O’Donovan line. 1840s correspondence between Dr. John O’Donovan and Timothy O’Donovan, Magistrate, Durrus suggested rightful Chief may be a ploughman in Castlehaven or cobbler in Waterford. To be let for 31 years part of Estate of Daniel O’Donovan, Esq., Kilglinny 760 acres. Keahagh in harbour of Castlehaven 121 acres. Apply Daniel O’Donovan, Baunlahan or William Heard, Attorney, Cork. 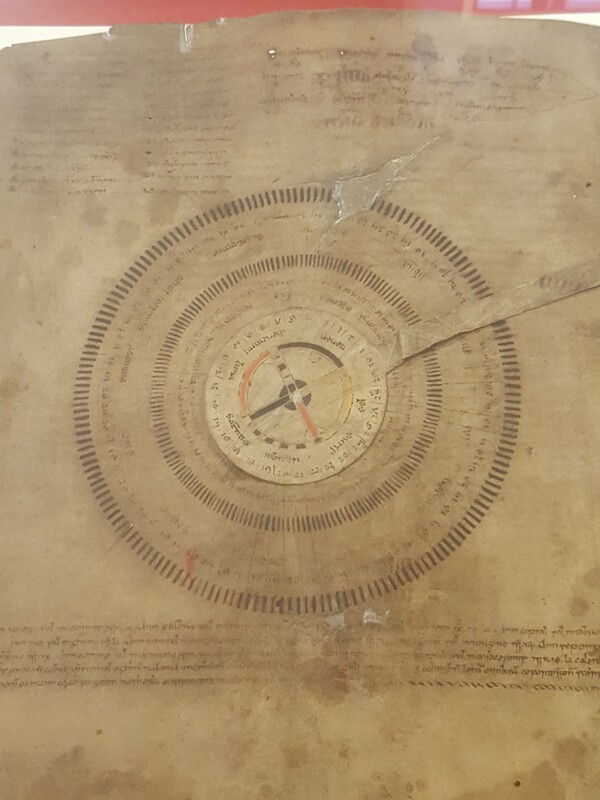 https://wordpress.com/post/durrushistory.com/7484 Recantations (Public Conversions to the Church of Ireland), St. Nicholas Church, Cork, 1765-1774, Robert Meakings, Ann Crowley, Stephen Walsh, Walter Reilly, Thomas Byon, James McCarthy of Dunmanway, Catherine Barker, Coleman Walsh (Possibly Drimoleague) and Juli(?) Murphy. 1835. 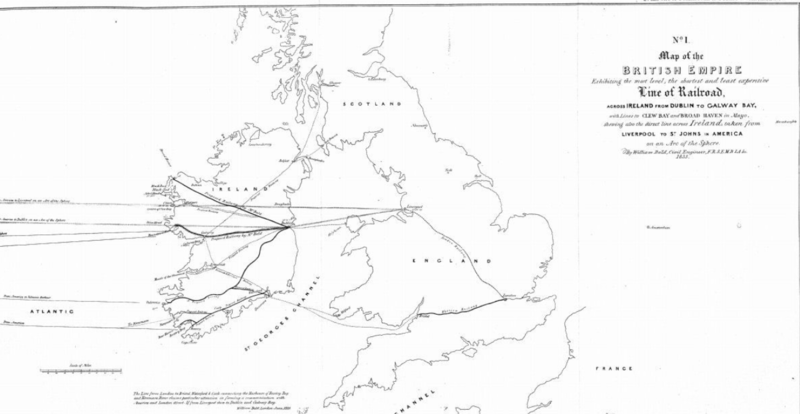 Suggested Rail and Sea Link Ireland to St. John’s Newfoundland. 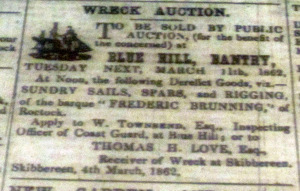 Sale at Blue Hill, Bantry, March 1862 of Wreck of ‘Frederich Brunning’ of Rostock, Sails, Rigging, Etc apply Thomas H Love, Receiver of Wrecks, Skibbereen. Sale at Blue Hill, Bantry, March 1862 of Wreck of ‘Frederic Brunning’ of Rostock, Sails, Rigging, Etc apply Thomas H Love, Receiver of Wrecks, Skibbereen. 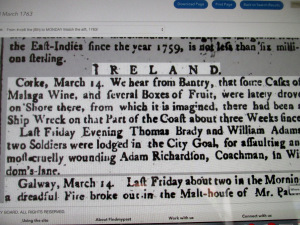 1763, Casks of Madeira Wine and Boxes of Fruit from Shipwreck, Bantry Bay. 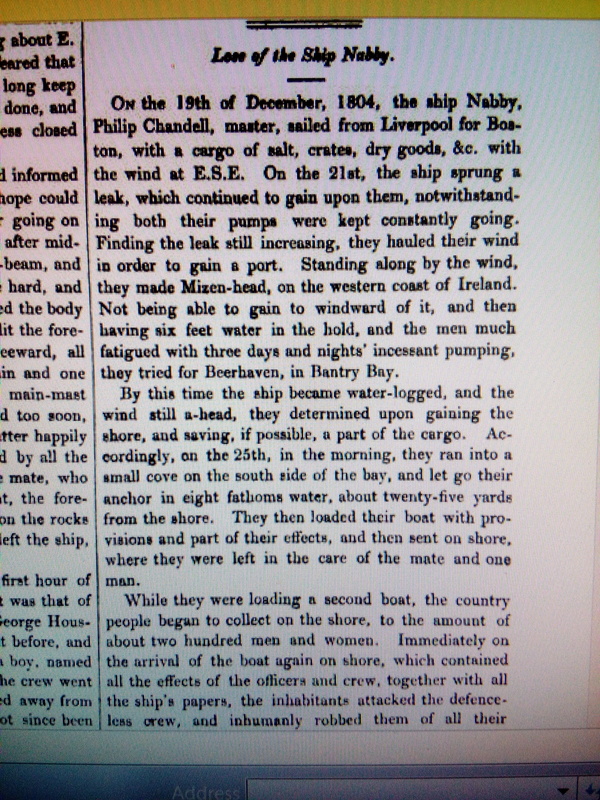 December 1807, ‘Good Rech’, of Pool (Poole), Shipwrecked off Crookhaven, Co. Cork, with Loss of Seven Lives, En Route from Newfoundland with a Cargo of Oil and Dried Fish to Messrs Penrose, Waterford (Family who Founded Waterford Glass) Some of the Cargo Exciting The Brutal Rapacity of the Surrounding Multitude. The Cork/Waterford Penrose family were Quakers related to the Cork Penrose/Fitzgerald family. They were active 18th century developers of Cork, Shipping Merchants whose property straddled the North Main Street area and the location of the present railway station. 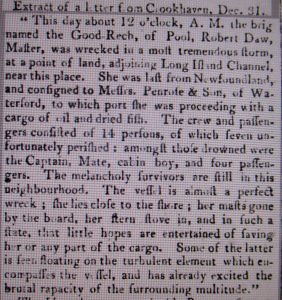 December 1807, ‘Good Rech’, of Pool (Poole), Shipwrecked off Crookhaven, Co. Cork, with Loss of Seven Lives, En Route from Newfoundland with a Cargo of Oil and Dried Fish to Messrs Penrose, Waterford (Family who Founded Waterford Glass) Some of the Cargo Exciting The Brutal Rapacity of the Surrounding Multitude. The Waterford Penrose family were Quakers related to the Cork Penrose/Fitzgerald family. They were active 18th century developers of Cork, Shipping Merchants whose property straddled the North Main Street area and the location of the present railway station. 1837, Shipwreck Orelia of Plymount, on Bere Island. 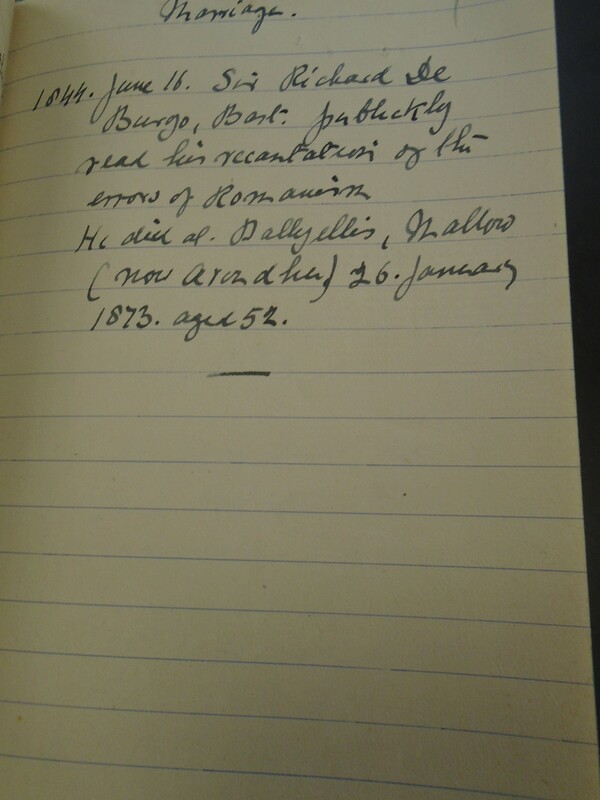 Efforts of Edward Puxley, Lloyd’s Agent and Patrick O’Sullivan. 1804, Loss of Nabby, En Route from Liverpool to Bandon on South Shore of Bantry Bay. Contents Pillaged by Two Hundred Men and Women. Crew Sheltered by Richard Donovan, Esq., David Mellifont, Esq., Magistrate, Donemark, Bantry, with Captain Scott adn Lieutenant Griffin and 40 Soldiers went to Bantry to Search for Stolen Property, assisted by Jonas Baldwin, Esq. Thanks to David Coffey, Melifont descendant. Magistrate: David Mellifont, 1794. Donemark house of Carrignarontha, Bantry. May have freedom of Cork 1761 as Esq. Appears in frequent deeds as witness 1761-1775 including soe in Bandon area. 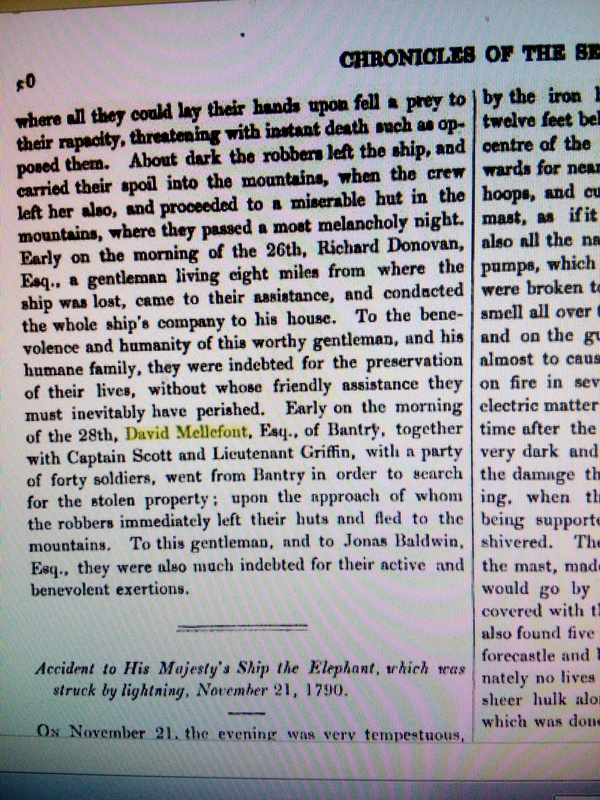 1779 Lieutenant Bantry Volunteers, Superseded 1810-30, Middleman on Lord Kenmare estate. Game Cert 1802. 1820 signed Memorial for new road Glengarriff to Castletownbere. 1822 his house and those of Pattison, Doyle, McCormack, Kingston attacked by over 400 Whiteboys searching for arms. William O’Sullivan, Esq., Carriganass Castle, native Ahill purchased Carriganass from David Mellifont, Donemark in 1817 for £250 and £50 rent. O’Sullivan prominent in anti tithe, repeal. Married 1804, Sophia Grey, Wexford, address given Mardyke, Co. Cork probably Skibbereen. Sophia Mellifont Nee Gray wife of David Mellifont had a brother called Nicholas Gray,he was secretary to the Wexford Insurgents 1798. Gray went to America and was involved in the 1812 War,he was Inspector General of the American Army. The Grays were from Whitfort House Wexford and Jamestown Co Wexford. Mellifont died Donemark 1835, significant debts, estate in Chancery and litigation. 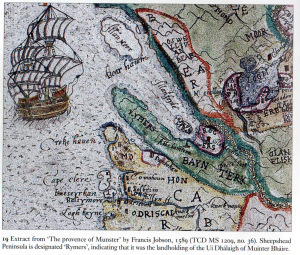 Francis Jobson’s Map of West Cork, 1589 including Cape Clear (Iniskyran), Baltimore, O’Driscolls, Rosbrin, Crookhaven, Bantry, Muintervara land of Rymers (O’Daly’s Bardic School), O’Sullivan Bere, Priest’s Leap. From Dr. Elizabeth Fitzpatrick on the Bardic School. Held by Royal Irish Academy.. Early Appearance of Woulfe Family (Merchants) in Durrus 1730s possibly in connection with Pilchard Trade. 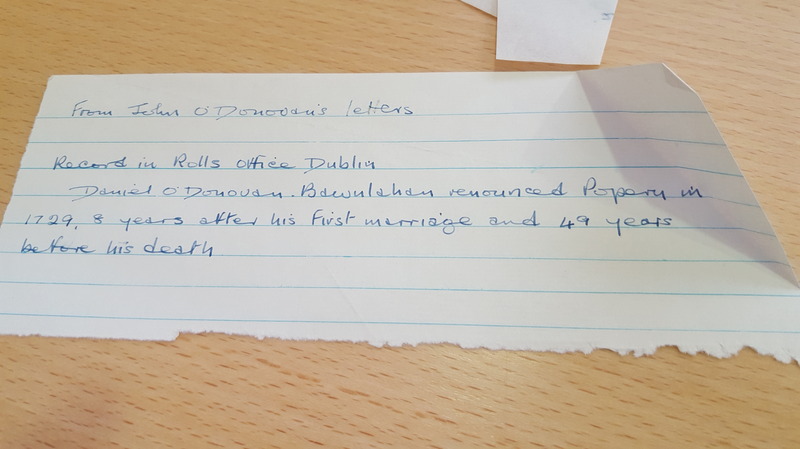 In a series of deeds transcribed by Ron Price the Woulfes appear, for the first time to my knowledge in the Durrus area. David, Merchant, Four Mile Water (Durrus), Robert Woulfe, Merchant, Dublin, later in 1737 David wife appears with a clerk John Flanagan. Other names are Robert Winspear who is a farmer in nearby Rossmore but described as Gentleman aged 45 in 1727 (born 1682). The Winispeares are shipwrights in Bantry since around 1630. A Winispeare Toye appears in Clonakilty around 1810. Richard Coppinger Gent appears 1737 as does Andrew Beazley. A lot of the old Cork Merchant families are in the Bantry area early 18th century as merchants in connection with the pilchards. There are Beasleys in Cork early 19th century coopers. They are related to the Harris family. The Harris are married into Evenson family mid 18th century with a base in Four Mile Water related to Harris medical family in Cork. 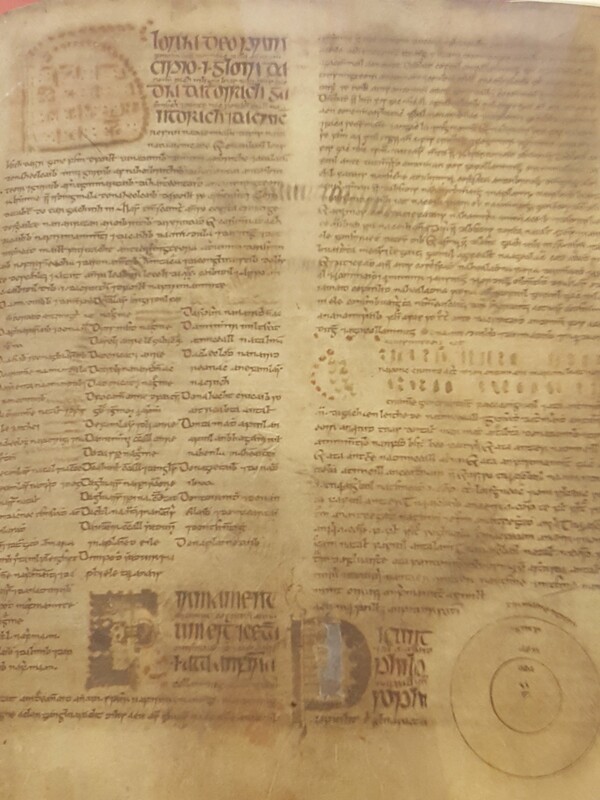 Abstract C&D assigned to B, their share of a lease from A of lands of Coulnahorna, Rossmore, Rossavan, Gerameen [Gearhameen, Durrus] & Classadoo [Clashadoo, Durrus]. The record of Bishop Dives Downs’ visits to Bantry in 1699 referred to ‘a lack of pilchards’. In an article by the Archbishop of Dublin in the 1726 Edition of ‘Boates Natural History’ it was stated that prior to 1688 there was good fishing of pilchards in the South coast, but since the fight in Bantry Bay the pilchards have not been seen on the coast. There is however reference in 1735 by Mr. Jenkins, giving evidence before a Commission on the state of Irish fisheries. He had seen the books of Mr. Meade who was involved in the fisheries in Bantry Bay from 1730 to 1745, and exported enormous quantities of pilchards. In 1749 Meade of Bantry obtained a premium from the Royal Dublin Society for having caught and cured 380,000 fish. Horatio Townsend 1810 writes of the disappearance of the pilchards and the gradual disappearance of herring and sprats. He says that by Smith’s time 1750 the pilchards had disappeared.